He tells them they must “take the propagation of Xi Jinping Thought of Socialism With Chinese Characteristics for the New Era as their chief and principal matter” (要把习近平新时代中国特色社会主义思想的宣传作为头等大事). They must “promote the penetration of Xi Jinping Thought of Socialism With Chinese Characteristics into the hearts of the people” (推动习近平新时代中国特色社会主义思想深入人心). They must “emphasize positive propaganda” (正面宣传为主), working to “raise the quality and level of positive propaganda” (提高正面宣传质量和水平), which means organization of such themes as, well, “Xi Jinping Thought of Socialism With Chinese Characteristics for the New Era at the Grassroots” (习近平新时代中国特色社会主义思想在基层). Concerning the third of these, “nurturing new people,” we refer readers to a series on this topic at China Heritage. A translation of the first section of Cai’s piece follows. 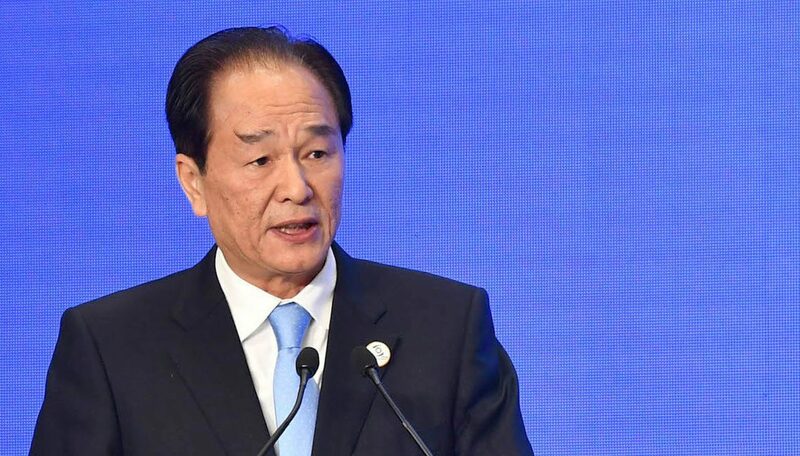 General Secretary Xi Jinping’s important speech to the National Propanda and Ideology Work Conference sparkled with the light of Marxist truth, and it is a programmatic document to guide propaganda and ideology work under the new circumstances. The study and implementation of the spirit of General Secretary Xi Jinping’s important speech is a major political task of those hereafter on the front lines of propaganda and ideology. Xinhua News Agency is the main force, main channel and main position of news and public opinion work, and we must set the example in the study and implementation of the spirit of Xi Jinping’s important speech, conscientiously raising our political position, strengthening our political consciousness, bringing our thought and conduct in line with the spirit of [Xi’s] speech, firmly holding to the position and demands that Central Party has for Xinhua News Agency, applying ourselves to foundational and strategic work, applying ourselves to crucial work and key points, applying ourselves in terms of work quality and level, thoroughly raising the communication power, guiding capacity and credibility [of our news], better carrying out the responsibility and mission given us by the Central Party. 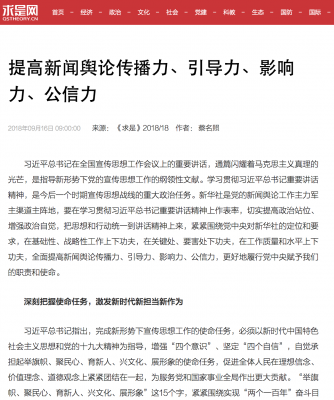 General Secretary Xi Jinping pointed out that completing our mission for propaganda and ideology work under the new circumstances requires that we must take our guidance from the Thought of Socialism With Chinese Characteristics for the New Era (新时代中国特色社会主义思想) and from the spirit of the 19th National Congress of the CCP, strengthening the “Four Consciousnesses” (四个意识), adhering to the Four Confidences” (四个自信), consciously raising the banner, gathering the hearts of the people, educating the youth, invigorating culture and developing our [national image] . . . These 15 characters, raising the banner (举旗帜), gathering the hearts of the people (聚民心), nurturing new people (育新人), invigorating culture (兴文化) and developing our [national image] (展形象), all closely concern the realization of the “two centenary goals” (“两个一百年”奋斗目标) . . . . The political precondition for properly realizing this mission is the firm establishment of the “Four Consciousnesses,” and we must arm our minds with Xi Jinping Though of Socialism With Chinese Characteristics for the New Era, maintaining throughout a high level of uniformity in terms of political positions, political orientation, political principles and political path with the Central Party with Comrade Xi Jinping as the core, firmly preserving the core status of General Secretary Xi Jinping within the Party’s Central Committee and within the entire Party, firmly preserving the authority of the Central Party and its unified leadership. The ideological foundation for properly realizing this mission is the firm establishment of the “Four Confidences,” and we must find our ideological nourishment in the roots of the Chinese land, raising our confidence and courage, adhering to the use of Chinese theory to explain Chinese experience, and to the use of Chinese positions to observe international questions, so that our propaganda and ideology work has clear Chinese characteristics (中国特色), Chinese style (中国风格) and Chinese form (中国气派). In accomplishing this mission, adherence to the correct political orientation is crucial, [and we] must strictly implement a responsibility system in our ideological work, firm in our orientation, grabbing [correct] guidance, holding our position, strengthening the political and leadership responsibility of our team, implementing the principle of party nature (党性原则) and the policy of politicians running the agency (政治家办社方针) throughout the full process of our news reports and at every juncture.